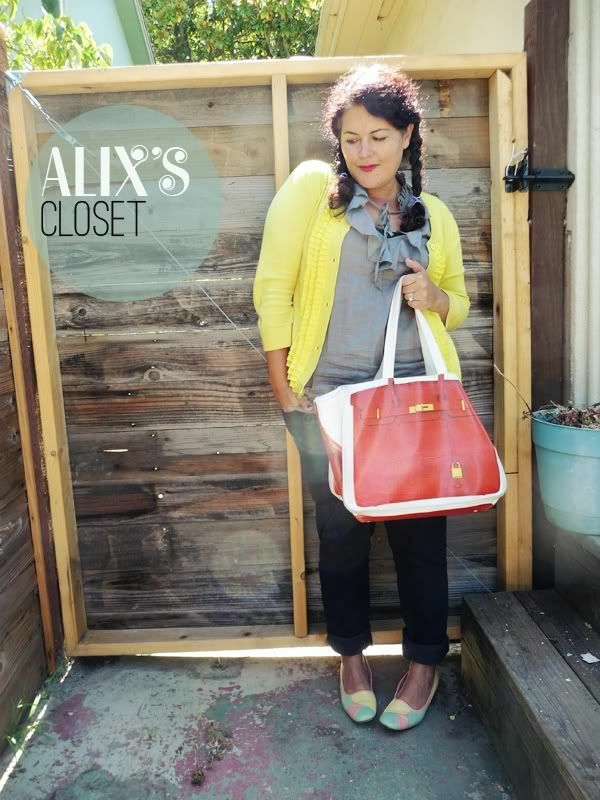 Alix’s Closet // Kickin’ it Around Town. Soooo I’ve recovered from the Missoni Mania. It was fun hearing everyone’s stories and take on the whole thang. I had planned to post a photo of me in my sassy Missoni socks and peering out from behind a lovely Missoni scarf, but frankly I’m on zig zag overload right now. Instead, here is a fun little outfit that is perfect for work or even kickin’ it on the playground with Wolfie. As a sidenote, I love looking at fashion posts and I especially love vintage clothing, but I have to say that sometimes it’s frustrating when you see a cute outfit on someone and know that it’s a one-of-a-kind garment that you will probably never ever be able to find. 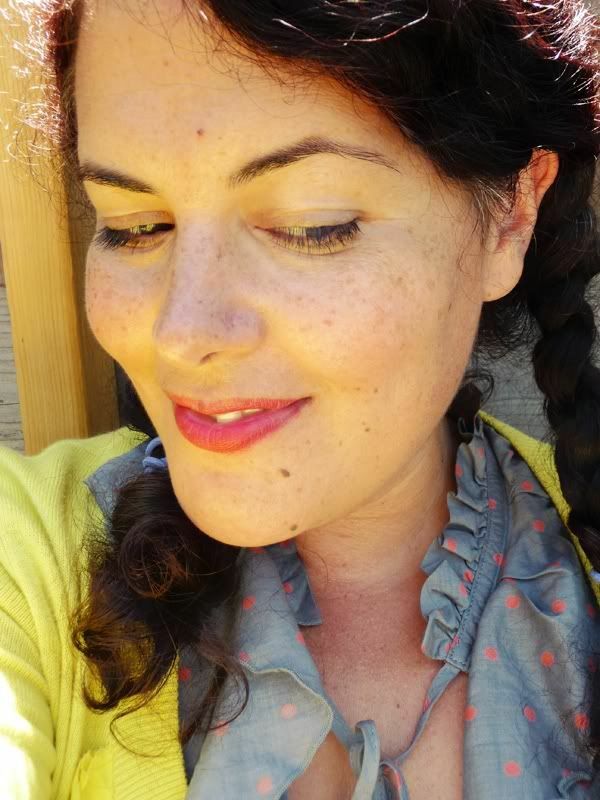 Unless, you know, the vintage gods are feeling particularly charitable and smile upon you and you find the EXACT same dress as the one you are coveting….it happens….but rarely! I’m pleased to report almost all of this outfit is culled from stores you probably have in your town. I found a way to make the look my own, but it’s pretty easy to duplicate if you like it! One of my wardrobe secrets is the Target Merona Collection. Not to be confused with just Merona. This is THE MERONA COLLECTION, dahling.They don’t carry it at all Target’s for some reason….but it tends to be a slightly more fashiony version of cute basics. I have three cardigans from this line and I always get compliments on them! This particular cardigan is really fab. 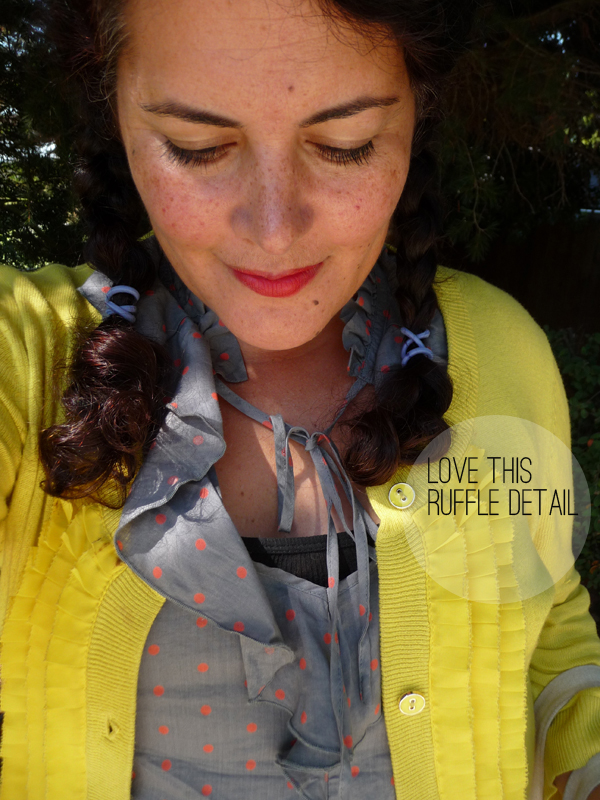 It has cool buttons, a great ruffle detail and it’s a bright lemony yellow. You’d never guess it was from Target and under $30! These shoes are another fave. For some reason modern American shoes only come in two versions: flats and sky high heels or platforms. In Europe the mid-size heel is all over the place. Probably because they walk everywhere! Whenever I find a nice mid-height heel I snap ’em up. These I found thrifting, but you can absolutely find similar ones on etsy and eBay for really affordable prices. Look for cute/unique colors and details and that low low heel! I swear, they’re just as comfy as flats (sometimes even more so!). 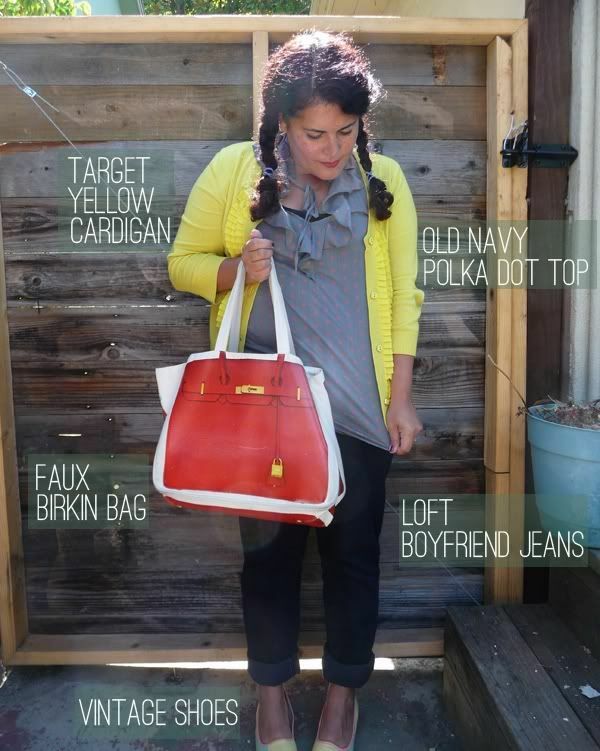 The other way to really make an outfit your own is with a fun/funky purse. I really don’t carry vintage purses on a daily basis because most of them are too small and dainty for our modern day livin’. I usually have SO much junk in my bag, I need something substantial! (hmmm, reminds me i should do another “What’s in My Bag?” post soon….) Anyway, this is a super fun handbag—and a riff on the $12,000+ Hermes Birkin bag. It has a photo of the original silk-screened on all four sides. 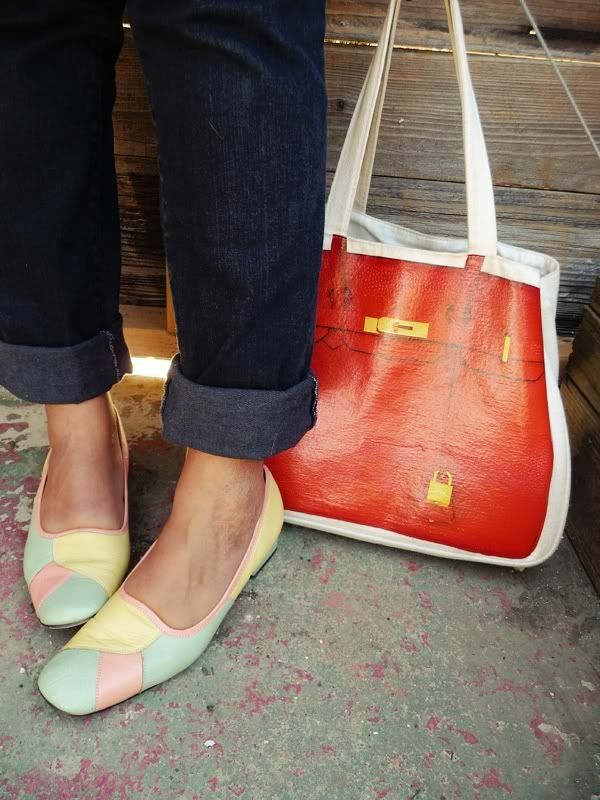 From a distance it looks like you might be high rollin’ and carrying the Bag to the Stars…..but really, it’s just a fun and funky $35 canvas tote! Because of all the ruffles and ties and what not, I’m not wearing a lick of jewelry—which is highly unusual for me! Just a little sunshine on mah shoulders. But really sometimes that’s all a girl needs. The Friday Link Hootenanny is comin up this afternoon, so stay tuned! 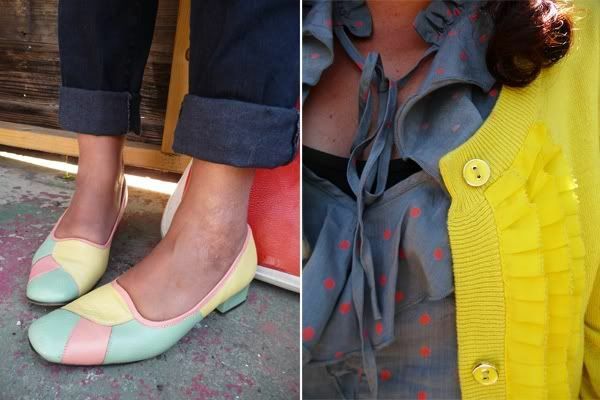 I love how much fun and color you manage to sneak into a regular old cardigan-and-jeans type outfit! 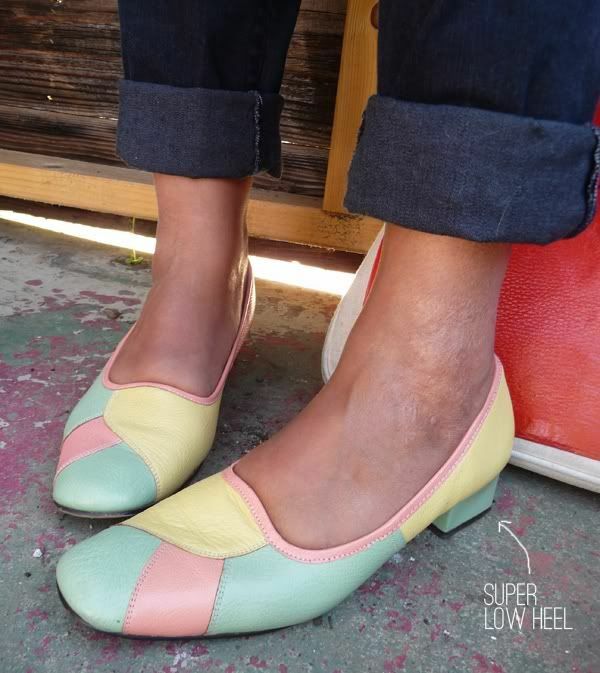 I am always really frustrated about the shoe selection these days, and I think those beauties you’ve got there have inspired me to hit the thrift today ISO my own funky low heels. ALSO- that “Birkin Bag” is hilarious! Love it! And I’d love to see what you’re carrying around in there- bag posts are one of my favorites. Oh those shoes, I love the shoes! i need you to dress me. 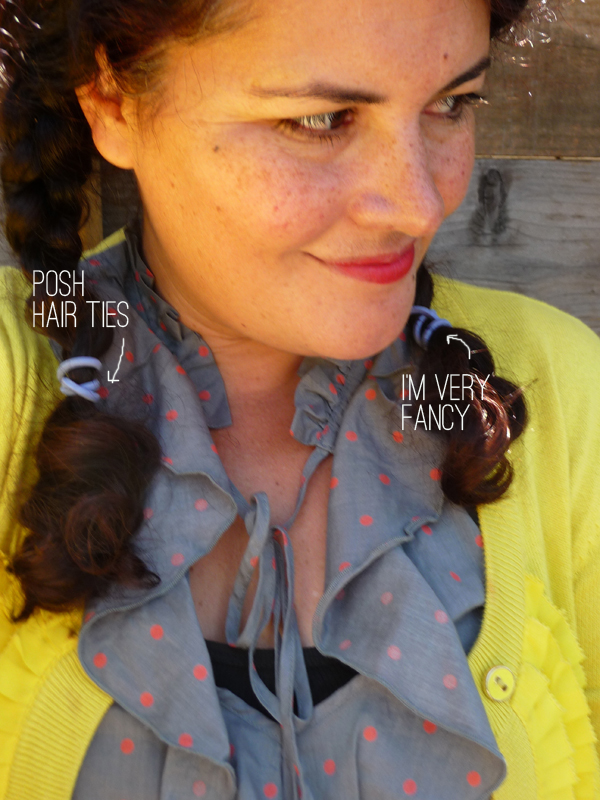 I love the way the ‘pull’ clothes together…matching without being match-y! And the faux Birkin, one of the favorite pieces in my arsenal, too!